Corporate social media accounts are increasingly dipping toes into weird Twitter and meme culture. The sassy Wendy's account instantly comes to mind, but accounts from Netflix and others have been following suit. Burger King, which often has weird commercials (and weirdly poignant commercials), got in on it earlier in August when it cryptically tweeted "mp; saf." The account was again being elusive over the weekend. It sent out a classic schoolyard retort for when you can't think of anything to say, but there wasn't much in the way of context for the statement. 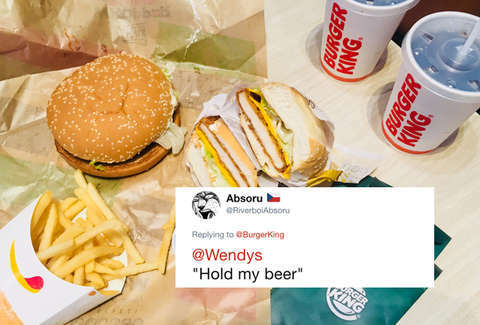 With Wendy's as a frequent antagonist in social media battles between burger flipping chains, it was cast as the antagonist of this tweet by many. But a quick scan of recent Wendy's tweets doesn't show anything for the King to get salty over. (Plus, Burger King hasn't been shy about slinging mud in that direction previously.) An inquiry about the tweet did not receive a response prior to publication. The tweet did, however, get a reaction from followers who thought the tweet was a mood or couldn't help but hazard a guess as to what the chain was beefing about internally. “I love @Wendys .” - Burger King, probably. Careful King, don’t Papa John this. There has to be a loophole to be able to say it 😂 escalate this to a supervisor so we can know. Maybe the mystery will be solved in a subsequent tweet. Maybe it's part of a grand scheme to write out the lyrics of a Queen song but can only be revealed once the master plan has been achieved. Maybe ending tweets with "legal reasons" will become the new "funding secured."